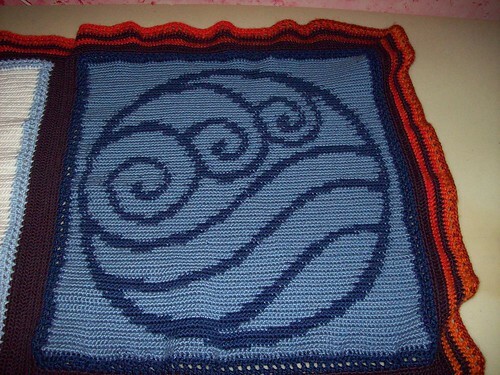 Avatar: The Last Airbender - IN BLANKET FORM! Last year, I happened upon this post on an Avatar: The Last Airbender forum. 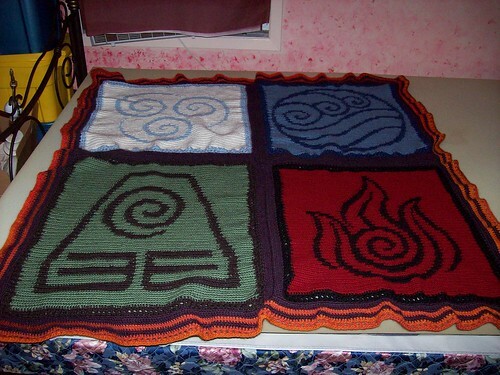 Kim had come up with a brilliant idea of mixing her obsession with A:TLA and her love of crochet. 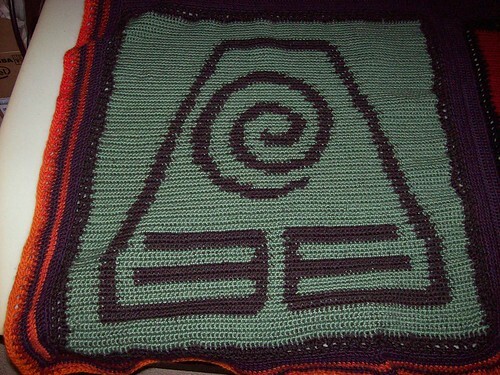 I had not crocheted in a few years, but I immediately fell in love with the Avatar Blanket. It wasn't too cartoony or juvenile - it was able to celebrate what is essentially a cartoon for kids at a level of sophistication that was suitable for adults. 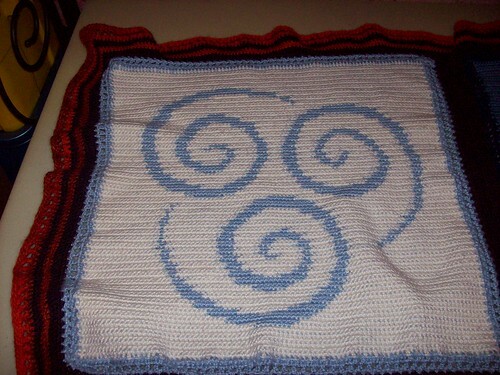 I say "my own version" because it is different than the original pattern posted by Kim. Firstly, it is a well known fact that I do not like beige, so the border colours needed to be changed. Secondly, I knew that if I was going to invest that much time and effort in something, the colours and texture had to be to my liking...and so, although the original pattern called for only approx. $50 in yarn expenses, I spent around $230. It was worth every penny. Other changes: I don't like grey (almost as much as I don't like beige), so the pattern for Air was changed to light blue; the original pattern called for the designs on each square to be done in cluster stitch - which takes up a LOT of wool - because I was using more expensive wool, I chose to do the designs in the same stitch as the rest of the square. In the end, I liked the more uniform look better anyway. I also changed the positioning of the elements. 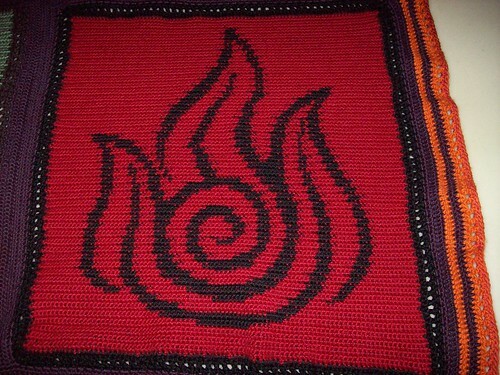 I didn't like the two boldest squares (Fire and Air) being next to each other, nor did I like air being at the bottom of the blanket - it just felt sort of wrong, somehow. So there you have it! I'm a dork, but an industrious dork! I also have some balls of wool left over, so if anyone has any suggestions for cool projects, let me know. I might just make everyone multicoloured hats for Christmas or something. In case anyone wants to know, the brand of yarn I used was Paton: Shetland Chunky (which is 75% acrylic and 25% wool and comes in 100g/3.5 oz skeins - which meant I had to double the number of skeins called for in the original pattern). Air is done in White and Sea Ice, Water is Steel Blue and Dark Navy, Fire is Deep Red and Black, and Earth is Light Sage Green and Earthy Brown and the main border colour is Rich Burgundy. The variegated orange is a brand called Tosca by Lang, I'm not sure what the colour is called. All yarn was bought at Yarn Forward, who were very helpful when I ran back to the store having realized that the different skein weights meant that I had to buy double what I had originally bought and get them all in the same dye-lots.